A new Ethan Stowell spot enters the best-happy-hour race with $7 margaritas, while a new branch of Jak’s in Green Lake might just have the best happy-hour burger deal in Seattle. Unlike a lot of big-name chefs, Ethan Stowell has bought into the happy-hour craze. His pasta-and-pizza bar specials are some of the most sought-after happy-hour deals in Seattle. Many have taken their shots, but Tavolata still hasn’t been dethroned from its perch as Belltown’s best happy hour. His latest, Super Bueno, more than any of his 16 other restaurants, is tailor-made for happy hour — margaritas by the pitcher ($33) and food that checks all the beer-snack boxes — crunchy and creamy finger food with gooey cheese. Come one, come all, it’s an all-age happy hour at this Wallingford Tex-Mex spot, which seems to get its color-scheme inspiration from nacho cheese. It’s a 200-seat restaurant with two patios, and most important, a children’s play area in a backroom, where children can’t be seen or heard. In the children’s section are adult-size tables for parents to dine while they keep tabs on their kids banging away at dinosaur figurines in the play pen a few feet away. Super Bueno may be the city’s first restaurant where the bar crowd and families can coexist in a happy-hour setting. This alone should win Stowell a restaurant equivalent to the Nobel Peace Prize. Thanks to the nature of its cuisine, service is fast. Most bar noshes are of the fast-casual variety — nachos, pozole, guac or salsa and chips, and most popular, its fat tacos (some stringy, dry carnitas but an otherwise strong lineup of tortillas folded with juicy brisket, chicken or ground beef for $3 each). Best was a bowl of watermelon chunks sprinkled with a chile-powder-salt seasoning, mint and Pop Rocks candy — refreshingly addicting in its salty, watery sweetness. And it will taste even better if you chase it with a shot of mescal. Super Bueno carries more than two dozen whiskeys, which is 20 amber bottles more than a tequila bar needs. It’s all about the margaritas here. The bar cranked through 600 gallons of them during its first month. They now make margaritas in batches to keep up with demand. Surely, the Jak’s devotees have told you that one of the city’s best happy hours just landed in Green Lake. Jak’s burger has cult status, a $7 half-pound patty grilled over an open flame (medium-rare is the only way to go) with all the fixings and side of fries. It’s as cheap a dinner — fast-food-like prices — that you can get during happy hour. This new Green Lake bar is part of the local steakhouse chain Jak’s Grill (branches in West Seattle, Laurelhurst and Issaquah). Jak’s can pull off a $7 giant burger because the chain goes through so much beef and has the economy of scale going for it. Jak’s on Green Lake is labeled an alehouse, but it’s the same iteration of the Jak’s Grill brand, only with a good craft-cocktail program in a slicker, contemporary setting. 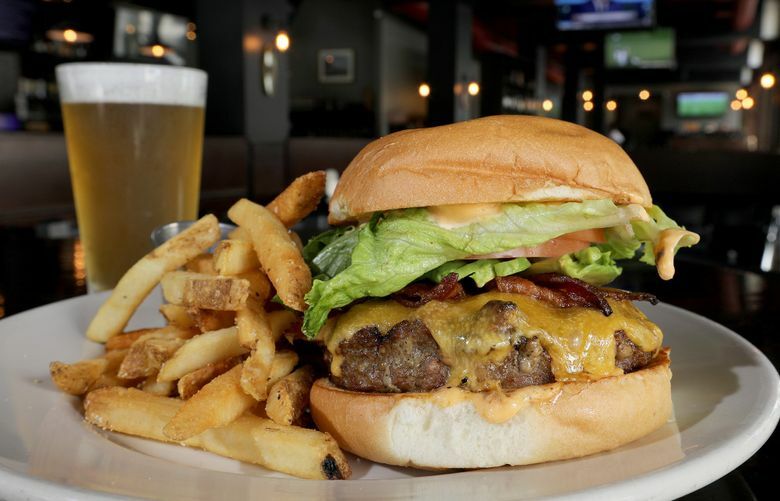 It’s likely to draw a hipper crowd at a time when this steakhouse chain seems staid and getting a dad-jeans rep.
Jak’s also runs two bars in Issaquah; the craft-beer spot Sunset Alehouse and the tequila bar El 42 Cantina. The Green Lake alehouse also runs a happy-hour brunch with dirt-cheap prices on egg dishes ($7) and Bloody Marys and other brunch cocktails for $5. Of course, everyone just talks about the happy-hour burger.